Willie Cleo Walker, 94, of Granbury, passed away on Wednesday, April 10, 2019. 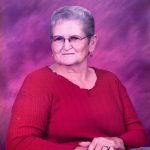 Graveside service: 2:00 PM, Monday, April 15, 2019, Holly Hills Mausoleum Chapel, Visitation: 3:00 PM – 5:00 PM, Sunday, April 14, 2019, Wiley Funeral Home, Granbury. Willie was born on March 13, 1925 in Granbury, Texas to Willie and Florida Rodgers. She graduated from Granbury High School in 1942 and was a longtime Hood County resident. She loved living on the family farm which eventually became Second Chance Farm, a special needs animal rescue. There was always a new baby showing up at her house for some TLC from her. She was preceded in death by her parents, her husband, Lester Walker, son, James Ray Walker, siblings: Ed Rodgers, Joe Rodgers, Roland Rodgers, Ella Mae Lewis, and Ellen Wilson. Willie is survived by her daughters: Sandra Walker and Dorothy Tapp, numerous grandchildren and great-grandchildren and her sisters: Roberta Huddleston and Nellobeth Johnson. In lieu of flowers, please send donations to the rescue at scftx.org or the mailing address SCF, PO Box 1085, Granbury, TX 76048. Her family, animals and volunteers will miss “Grandma” greatly. The farm will not be the same without her. My deepest sympathy to Sandi and rest of the family at the passing of this special woman who so many of us referred to as "Grandma" or "Sandi's Mom". She was an inspiration from the first time I met her and I immediately realized some of the qualities I so admired in Sandi came from her Mama, among them her strong determination and her love for animals. One memory I'll never forget is Sandi and I returning from a Second Chance Farm event to find she had been out raking and bagging leaves, the reason this stands out is she was 92 at the time. I thought to myself how I hope I might be up to that when I reach her age. May she RIP. My condolences for the loss of your mom. I lost my mom 33 years ago I think of her everyday. Hold on to those precious memories. It brings great pain to lose a loved one in death. But it is good to know that there will be a time when there will be no more death. At Revelation 21:3, 4 God's word gives us that assurance. May this taught give you some comfort and may God give you his strength.